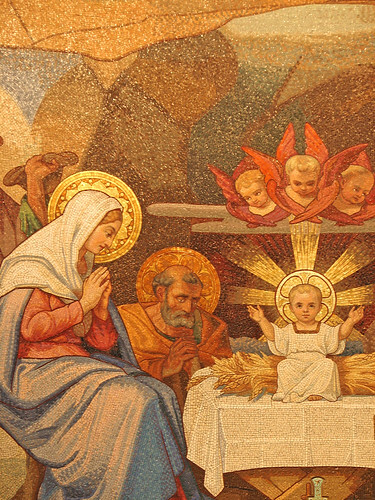 The Incarnation: Paradox or Contradiction? We’re in the process of flushing out the theology of the ReKnew Manifesto, and we’ve come to the point where we should address the Incarnation. This is the classical Christian doctrine that Jesus was fully God and fully human. Today I’ll simply argue for the logical coherence of this doctrine, viz. it does not involve a contradiction. There is no denying that the Incarnation is paradoxical. It is hard, if not impossible, to conceive how a person could be, at one and the same time fully God and fully human. I don’t think this should surprise us too much, however. After all, we confront similar paradoxes in science as well as in our everyday life. For example, as I’m sure most of you have heard that physicists tell us that light has the property of waves in some circumstances and of particles in other circumstances, yet we have no way of understanding how this is possible. Even the nature of time and space is paradoxical if you think about it. We can’t conceive of time having a beginning, but neither can we conceive of it without a beginning. So too, we can’t conceive of space having an end, but we also can’t conceive of it not having an end. If things as basic to our experience as the nature of light, time and space are paradoxical, I don’t think we should find it too surprising that things surrounding God are mysterious. So, is the teaching that Jesus is fully human and fully God a contradiction or a paradox? If the very meaning of “God” entailed “not also human,” or if the very meaning of “human” entailed “not also God,” then we would indeed have a contradiction on our hands. But who can claim to know so much about God and humans that they can be confident they are logically contradictory? I would rather argue that we only know God on the basis of what he in fact has done. And since I have compelling reasons for believing that he in fact became a human, this is proof enough to me that any claim that “God” and “human” are mutually exclusive is a contradiction. Having said this, I should add that I believe the way many theologians have worked out the doctrine of the Incarnation has involved contradictions. For example, many claim that if Jesus is fully God and fully human, he must be simultaneously omniscient and non-omniscient. But how is this different than asserting “married Bachelor”? I would rather argue that the Son of God set aside the exercise of his omniscience in order to become a human, for, I would argue, being non-omniscient is part of what it means to be human. I would argue the same for any other divine attributes that contradict the meaning of “human.” This is called “a kenotic” (or self-emptying) Christology, and I’ll say more about it in a subsequent blog. I’ll end by noting that the distinction between paradoxes and contradictions is always important to keep in mind when theologizing. While the line between paradoxes and contradictions can sometimes be blurry, I am personally convinced that a good many of the paradoxes that surround classical theology are in fact contradictions. For example, Reformed theologians argue that their belief that God predestines the free actions of humans and angels is a paradox. But I would argue that the very meaning of “free” means “not predestined” and the meaning of “predestined” means “not free.” I thus consider this teaching to involve a contradiction, which means it is meaningless. In any event, whenever theologians appeal to a paradox or mystery, I encourage people to be a little suspicious. They may be correct, as when they claim this for the Incarnation. But they may also be trying to conjoin things that are in fact logically contradictory. Isn’t it contradictory to say Jesus is “fully God” and “fully human”?